Popular courtesan Violetta (soprano Venera Gimadieva) finds love with the handsome Alfredo (tenor Joshua Guerrero) in WNO’s La Traviata. Photo by Scott Suchman. The Washington National Opera (WNO) turns again to one of Giuseppe Verdi’s beloved masterworks to begin their 2018-2019 season. Artistic Director Francesca Zambello is joined this season by new General Director Timothy O’Leary, with no lack of fanfare for the immensely positive reviews of his work the past decade at Opera Theatre of St. Louis. Their experience in previous collaborations and common vision is being billed as the start of a new era for the WNO – the duo stated it outright in their pre-curtain address to the audience. 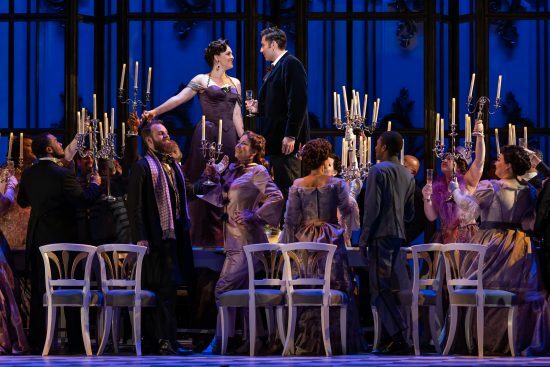 This new vision for the company will likely have more to do with the promotion of new works than treatment of staples, as this production of “La Traviata” was typical of what is expected from the Washington National Opera: mostly strong leads, great playing from the orchestra, a well-rehearsed chorus, and design aspects that largely hit their mark. Leading the orchestra, and really the pacing of just about everything, was conductor Renato Palumbo. His high-energy gesturing and bullish cueing of the singers seemed a constant battle to force his will upon the other artists. The usual elegant, spacious phrasing and subtle rubato were replaced with an undercurrent that constantly hurried and lunged toward what was next. The orchestra was far more successful in surviving this treatment than the singers. Their collective cohesion adapted to the pacing in a way that allowed nuance to survive and the character of Verdi’s score to remain intact. The opening party scene was particularly effervescent with playing as delicate on the palate as the finest of sparkling libations. Soprano Venera Gimadieva was excellent in the leading role of Violetta Valéry and was also only minimally affected by the pacing of maestro Palumbo. She projected above all without sounding loud or forced and navigated the upper register with crystalline accuracy. Never overshadowed, her presence demanded just the right amount of attention without monopolizing. Joshua Guerrero (Alfredo Germont), much like his character’s plight, was not so successful in having his artistry survive the external forces. Though his singing was clear, lyrical, and possessed beauty of tone, volume was insufficient in remaining to the fore and he frequently was forced to clip the ends of phrases in order to keep up with the uncompromising pace. As Alfredo’s father, Lucas Meachem was steady and imposing in character, but sufficiently expressive in delivery. His duet with Gimadieva in the second act was the best singing of the evening. Deborah Nansteel (Flora Bervoix) was the standout from the supporting cast – her powerful and confident voice matched that of her stage presence. As always, the WNO Chorus was well-rehearsed and unified. They added depth to the large party scenes and play their acting roles well. However, usually a tremendous presence, here they were a bit muted and, though they remained perfectly together, did not always sync with the orchestra. Peter Davison’s set is beautiful and creative. Rotating wall panels dramatically shift scenes and layered textures allow actors to occupy space on stage without encroaching upon one another’s territory. Lighting by Mark McCullough further enhances the space and the costumes of Jess Goldstein are completely simpatico, with the exception of the dancers at Flora’s party where everything becomes a bit too ornate – the scene works fine once the dancers depart and sleek tuxedos provide necessary contrast to the opulent set. This traditional production is given one creative twist in that during the overture and intermittently throughout we are taken to Violetta’s hospital room where she reflects on her life as death lingers close, effectively turning the opera into a flashback of sorts. The subtle adaptation is successful and shifts only slightly the lens through which the story unfolds. It will be interesting to see how the production settles during its run. Either maestro Palumbo will need to acquiesce to the will of the other musicians, or they will have to manage to keep up with his implacable pacing. 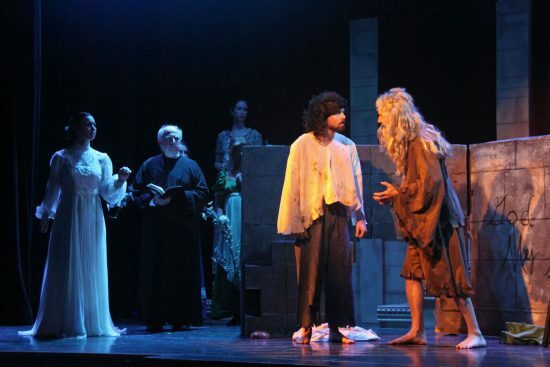 The production is enjoyable and worthy of the organization’s talents, but if parties could prove better at compromising than other Washington entities, the resultant gem would be something to celebrate. This production at The Kennedy Center runs through Sunday, Oct. 21 and features 3 casts, including one comprised of Domingo-Cafritz Young Artists. For tickets and more information, click here.